Vietnam has seven tourist attractions named among 25 natural wonders in Southeast Asia voted by Fodor’s Travel - a trusted resource offering expert travel advice for every stage of a traveler’s trip for nearly eight decades. In its article titled “25 Natural Wonders in Southeast Asia You Have to Experience to Believe”, Fodor’s Travel said that Ha Long Bay in the northern coastal province of Quang Ninh was named one of the new Seven Natural Wonders of the World and a UNESCO Natural World Heritage Site, with around 2,000 islets sprawling across an indescribable landscape of almost 600 square miles. The bay’s floating mountains and emerald-green waters are said to have inspired the animated landscapes of Avatar, and have been used as the set for films like Kong: Skull Island and Pan, it said. 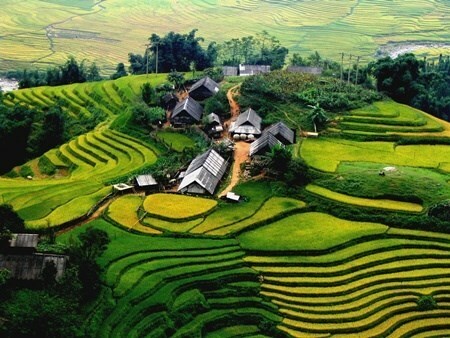 Another wonder in the list is Sa Pa, home to the highest mountain in Vietnam (Fansipan). The website said with its adventurous trekking and natural landscapes, Sa Pa in the northern mountainous province of Lao Cai is the ideal vacation destination for those looking to break a sweat while also enjoying the unique flora and animals native to the region. The website also affirmed Phong Nha Cave in the central province of Quang Binh is a must-see for travelers, as it is home to an expansive underground lake, as well as one of the largest underground rivers in the world. Also named in this list, the province’s Son Doong Cave was described as the largest cave in the world, which was carved by underwater springs over three million years ago. Other Vietnamese tourist attractions in the list are the Sand Dunes of Mui Ne in the central province of Binh Thuan, Thac Bac (Silver) Falls in Lao Cai, and Ba Vi National Park in Hanoi. Attractive destinations in Thailand, Laos and Cambodia like Thi Lo Su Waterfall, Doi Inthanon National Park, Tham Khong Lor Cave, and Tonle Sap Lake are also named in the list by Fodor’s Travel.